Tracy has been in the gas grill industry for over 18 years. She has a Bachelors of Business Administration and manages The BBQ Depot Online. Steaks are the epitome of barbeque cooking. Yet, cooking the perfect steak can sometimes seem like an impossible task. In order to get the steak perfectly charred on the outside, yet juicy on the inside, here are some simple steps to follow. Have everything ready to go. 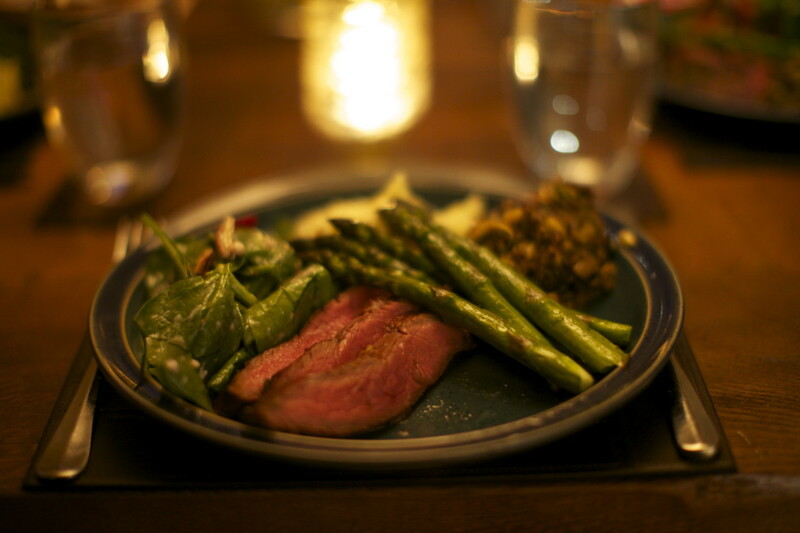 The best chefs and barbeque masters know that preparation is the first, and essential step, to making any great food. Place all necessary plates, utensils, accessories, and seasonings near your BBQ so that they are readily accessible whenever you may need it. Not only does this help you in the timing of cooking your perfect steak, it also keeps your, your loved ones, and your home safe from the dangers of an unattended grill. 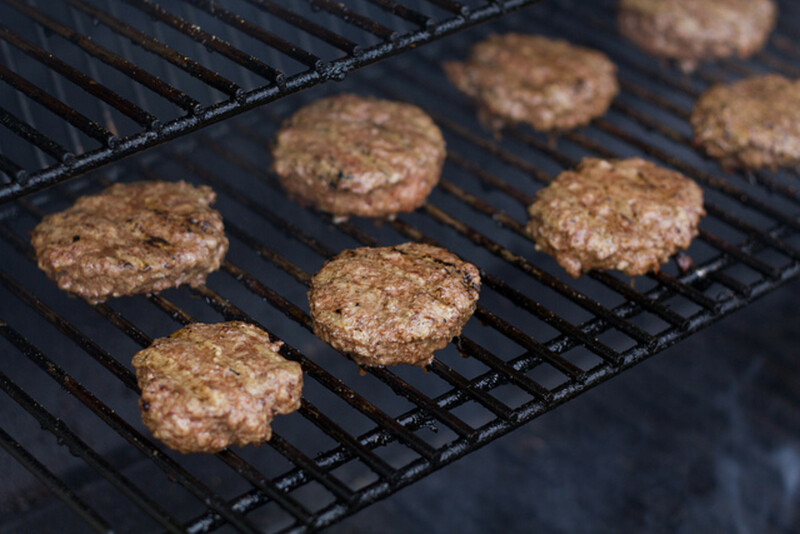 Once everything is ready, the next steps is to light your grill. Depending on the type of grill that you own, make sure that you light the grill with plenty of time for it to heat up and be ready to cook. 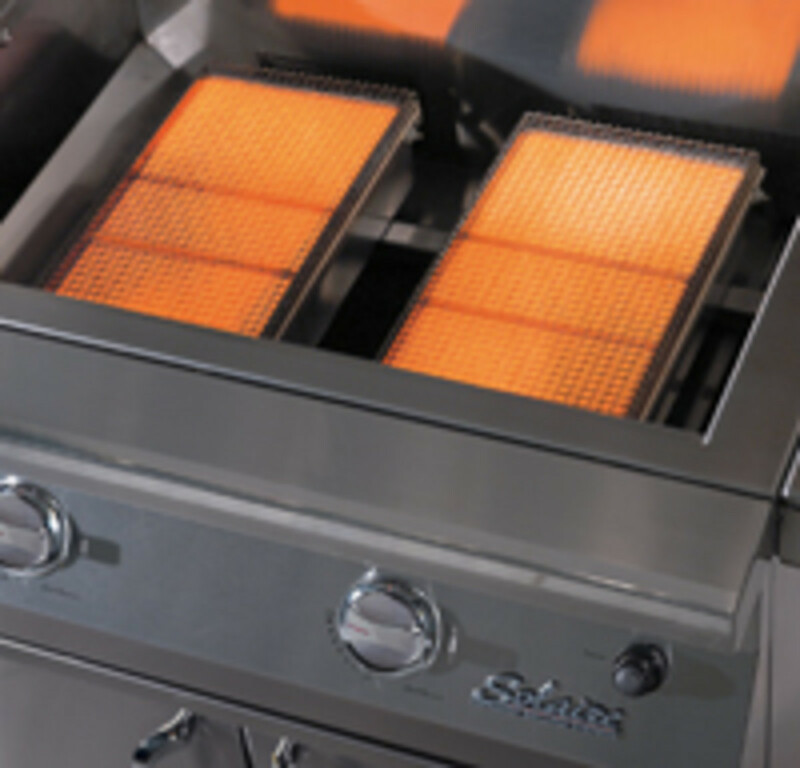 Charcoal grills take the longest to heat up, while gas and electric grills need a much shorter preparation time. Once your grill is lit, the time has come to take the steaks out of the refrigerator. Room temperature steaks cook more evenly than cold steaks, so make sure that they have plenty of time to warm up before you place them on the grill. If you are using a marinade, leave the steak in the marinade until it is time to put it on the grill. Otherwise, prepare the steak for cooking by brushing both sides of the steak with a light layer of olive oil and a generous dusting of salt and pepper. When you’re grill is ready for the steaks, there is one final step in your preparation. If you are using a charcoal grill, move the now gray-ish colored charcoals over to one side in order to create a cooler spot on the grill. On any grill, keep the steak away from large or jumping flames. The flame size will increase as the juices and fat run down the sides of the steak. 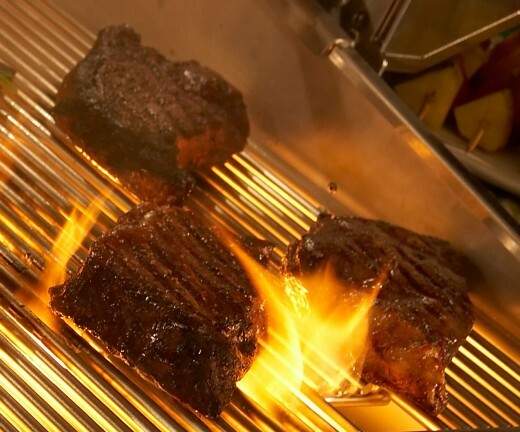 These flames can burn the outside of your steak and should be avoided. want to create the diamond pattern on your steak, leave the steak on the grill for 2-3 minutes and then, with a pair of tongs, rotate it 45 degrees, and cook it for the remaining time on the side. Always use a pair a tongs when rotating of flipping your teaks in order to keep them juicy. Stabbing or cutting your steak will cause the moisture and juices to run out of the steak, leaving it dry. Once the steak is done, take it of the grill and let it rest on a wooden board for 5 minutes before cutting into it. This will help keep the meat juicy, and leave you with the perfect steak. According to barbeque pro Chris Lilly, the key to great barbeque “is sealing in flavor." One of the best ways to seal in that flavor is to use marinades. Marinades season your meat while locking in moisture. Here are a few tips to getting the most out of your marinade. The first step is to prepare your meat. The smaller and thinner the meat, the faster the marinade will be able to penetrate the meat. 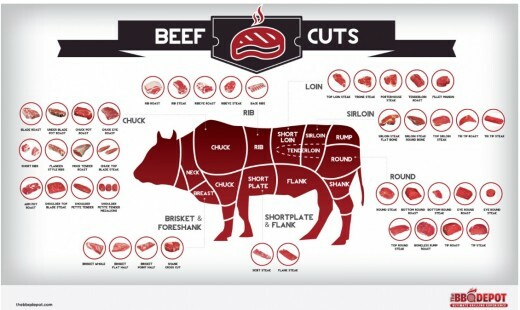 Cut your larger pieces of meat into smaller pieces to make sure that every piece gets evenly marinated. The second step is to connect your meat with the marinade. Clear plastic containers or plastic bags are some of the best venues to place your meat and marinade. Not only does this decrease the mess, but also by sealing out the air, you actually need less marinade on your meat. You want to make sure that your meat is completely submerged in the marinade, which means that you need about two cups of marinade for every two pounds of meat. The third step is to give the meat time in the marinade. As a general rule of thumb, you want to leave your meat immersed in the marinade for at least thirty minutes. Generally, the longer you leave the meat in the marinade, the better the flavor, and with beef, it is recommended to leave it in the marinade overnight. This increased amount of time in the marinade will make your beef incredibly tender. However, while beef is better the longer you leave it in the marinade, chicken can actually be over marinated. Over marinated chicken becomes extremely tough and hard to eat. Once you place your meat on the grill, let the marinade do its work. In order to bring out the full flavor of the marinade on your meat, baste your meat in the last 10 minutes of cooking. However, just be careful that you baste your meat with a freshly made marinade instead of using the original marinade. Basting the meat with your original marinade can potentially contaminate your meat. Marinades give you all sorts of flavor potential with your BBQ. If the process seems daunting, start with the prepared marinades in your local supermarket and then, as you discover what flavors you like the best, try creating one of your own. What is the Difference Between a Marinade and a Rub? For those who love to barbeque, they know one of the best ways to get the full flavor out of your meat is to pre-treat it. In the barbeque world, this most often involved covering your meat with either a marinade or a rub. But just what is the difference between these two procedures? And when should you use one or the other? Marinades are liquids that are designed to both add flavor and to tenderize your meat. They are constructed of an acid (such as citrus, alcohol, or a vinegar), spices, and herbs. The acid breaks down the connective tissues in the meat, which results in the meat becoming tenderer. Tough cuts of meat can – and should – be marinated for long periods of time. This could mean anywhere from 4 hours to overnight. The longer your marinade a meat within this 4 to overnight time period, the more tender it will be. Cuts are meat that are already more tender (such as chicken) should be marinated for less time (under 2 hours). As the tissues are being broken down, it is possible to over-marinade meat. Over-marinating meat will cause it to turn to mush. In general, you should use ¼ c or marinade for every pound of meat. Marinades can be placed in large, plastic bag or in a glass or ceramic dish with a plastic covering. Due to potential food poison hazards, you should never marinade a piece of meat at room temperature for longer than 40 minutes. For a longer marinade, place the container in the fridge. Marinades can be used to baste the meat on the grill. However, again, due to potential food poison hazards, it should never be used as a sauce. Rubs are a dry seasoning that work to pack flavor into your meat. Unlike marinades, rubs do not work to tenderize your meat. Rubs generally consist of a blend of dry spices and seasonings or, in terms of a paste rub, a dry blend that is mixed with a wet ingredient (such as water, oil, or soy sauce) in order to create a paste. Though the name suggests otherwise, you should never rub a rub into a piece of meat. Instead, you should gently pat the rub onto the meat until it is well coated. The strength of the rub flavor will depend on how early you add it to the meat. While a rub can be added immediately prior to placing the meat on the grill, you can also leave it on for several hours. Just ensure that the rubbed meat is placed in the refrigerator to prevent potential food poisoning hazards. Marinade injectors are a common accessory in the barbeque world. However, for those who are unfamiliar with the tool, there are many question as to just why and how you would use it. In this article we’ll take a look at both of those questions and let you know how a marinade injector can change the way that you grill. As for the why, marinade injectors are a great way to inject an explosion of flavor into your meat. Because you are injecting the marinade into the actual piece of meat, it ramps up the potential level of flavor that you can accomplish. As it also specifically injects a marinade, they also help ensure that your meat is juicy and tender. And now for the how. Marinade injectors are fairly easy to use. The correct moment to us your injector is after you have prepared both your meat (i.e. cleaning, trimming, and seasoning), and your marinade. Injectors work with all types of marinades (including the ones that you love to baste with), so feel free to be creative. Always make sure that your injector is cleaned before you use it. This includes cleaning it before using it for the first time. This will prevent any unwanted flavors or contaminates from making it into your meat. Pour your marinade into the chamber of your injector. Once the marinade is inside, oil the tip of the needle. Not only does this protect the needle, but it will help it slide more easily into the meat, giving your more control. At this point you are ready to stick your needle into the meat. If you are using a meat with skin (such as chicken or turkey), make sure that you stick you needle all the way through the skin and into the actual meat. Once the needle is in the meat, slightly press down the plunger to disperse a small quantity of marinade. Never fully push down the plunger, as you want to spread the marinade out over the entire piece of meat. Pull the injector out and the, without re-oiling the needle, plunge it into a different area of the meet. Disperse another amount of marinade. Continue to plunge and disperse the marinade into different part of the meat. Try to separate your injections with equal distances and to disperse equal quantities of marinade with every plunge. This will help ensure that you keep an equal level of flavor throughout the entire piece of meat. Once you have dispersed the marinade into the entire piece of meat you are ready to grill it. Grill as normal, to your desired level of doneness. When your meat is cooked, let it rest for at least 15-20 minutes before you start cutting off slices. This resting period is essential as it allows all the juices of the meat to reenter the meat. This prevents your meat from drying out. When you’re getting ready to barbeque, you want to take all the necessary steps to ensure that your food will be packed with flavor. One of the best ways to do that is to marinate your meat. 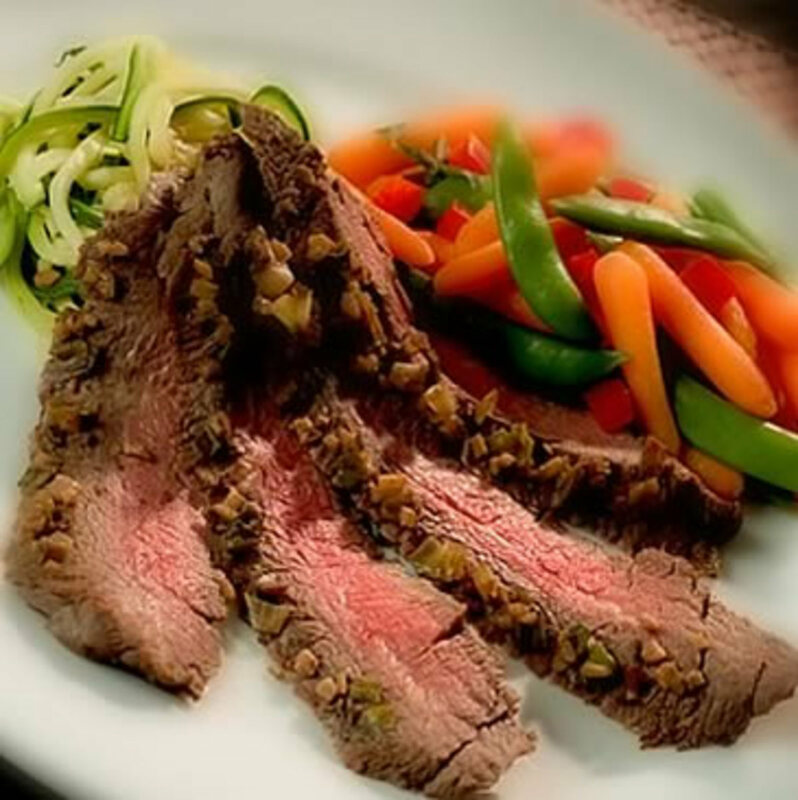 Marinade is particularly good on steak, as it both infuses the meat with flavor and leaves it soft and tender. Here is a recipe that you can try this summer and help take your barbequed steak to a whole new level. The sweet and fruity flavor of pineapple is a great way to add an exotic sensibility to your barbeque. This marinade will make about two cups, and the combination of flavors will transform your steak into something truly special.